However, I mentioned that I wanted to revisit it, and now, as an adult, this past weekend I did just that. I first got into anime in 1996, two years before the Japanese airing of Cowboy Bebop, and six years before its American TV debut. My first anime was Record of Lodoss War and it taught me that, contrary to the commercials of the time, anime wasn't just ultra violence. But more than that, in a time where nearly all American TV was made up of self-contained episodes, I found that anime was a sea of 26-episode serialized epics with character depth and intricate storytelling rivaled only by novels. That is why I fell in love with anime: to experience more and more of these long, detailed stories that captured my imagination. By the time I got hold of Cowboy Bebop, it was 2001; but my reasons for watching had not changed. I was in it for the overarching plot. But serialized epic, Cowboy Bebop is not. Six episodes in, I felt that I was still waiting for the story to start, and so I dropped it without a second thought—something I very rarely did at the time—and moved on to the next of the two to three anime I was planning to watch that week. As an adult my tastes have not so much changed as broadened. Now I enjoy thought experiments, genre deconstructions, thematic explorations, and character-driven narratives alongside the epic plots I enjoyed as a youth. So suffice it to say, there was a lot more for me to love in Cowboy Bebop this time around—though I still found it a bit boring on occasion. A lot of people tell me that Cowboy Bebop is what got them into anime. And it's easy to see why: It's nothing like the vast majority of American cartoons of its time. It has lots of action with gun fights, space battles, and kung fu beat-downs. On top of that, the characters are cool, calm, and composed even as they go up against insurmountable odds. And capping it all off are a plethora of adult-themed stories that range from noir mysteries to Wild West shootouts in space. More than that, its self-contained episodic nature makes it easy to pick up and watch. You don't have to worry about missing an episode and being lost. You're guaranteed a complete adventure in practically every episode. And all of this is just the surface layer of Cowboy Bebop. Cowboy Bebop is not the story; rather, it is the epilogue to a story that we never get to see. It’s the epilogue to three stories actually—Spike’s, Jet’s, and Faye’s. Over the course of the anime, we see only the briefest flashes of their true stories—their pasts—and these glimpses are usually related to how their stories ended, thus setting them on a course to encounter the Bebop. Each of the three has a different relationship with the past. Spike is trying for a complete disconnect from his own—though he is the one most affected by it despite his protestations to the contrary. He likens his time on the Bebop to that of a dream—and it is an apt observation. His time as a bounty hunter is full of wonderful adventures and new friends, but it all leads up to his waking up and returning to face the consequences of the real world. But while Spike is trying to forget his past, Jet is well-connected to his and uses it as an asset—despite the problems it often causes as old ghosts are brought into the light. Faye, on the other hand, is living Spike's dream—a complete break from the past—yet what she wants more than anything is to have that past and the sense of knowing-your-place that it carries. For a show with so much overt action with its shootouts and space dogfights, it's impressive how subtly the interpersonal relationships are handled—especially when it comes to Spike and Faye. Faye is a person who is without ties—feeling that having them only means that she will end up losing them. But unlike the numerous other males she encounters, Spike has no interest in building any kind of ties with her—and this in turn gives her a place where she can feel safe and at home. As their relationship grows, there is no overt drama, no outright confessions of love; rather, their actions tell the story. At the start, neither one of them goes out of his or her way to help the other. But this changes little by little. At one point, Spike jokes with her, asking if she would really come help him if he were in mortal danger. Later in that episode, she does just that—and the two never mention it. Then, near the end of the anime, when faced with protecting Faye and Jet or rushing off to meet Julia (his old love), he stays to protect them—constantly covering Faye in the resulting dogfight. Watching their attitude toward each other change across seemingly unrelated episodes is one of the most enjoyable aspects of the series and it makes their final scene together all the more powerful. I almost hesitate to mention the music of Cowboy Bebop—not because it’s bad—but rather because it’s so universally acclaimed that I feel like I am preaching to the choir. Composed by Kanno Yoko, the brilliant mind behind the music of Escaflowne, Ghost in the Shell: SAC, Macross Frontier, and numerous other well-known anime soundtracks, the Cowboy Bebop soundtrack gives an amazing cross section of jazz and blues, perfectly matching the tone of each scene. In other words, Kanno's soundtrack puts the titular “bebop” in Cowboy Bebop. 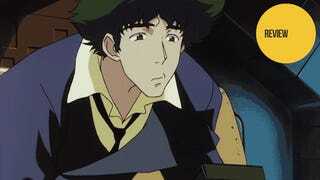 Most of the episodes of Cowboy Bebop have some important role in the overall series. They provide backstory, develop characters, further the main plot or simply flesh out the world. However, more than a few episodes of the series are filler and do none of these things. Now, it should be noted that filler is not necessarily a bad thing—it is often a vital part of good pacing in a series. After an action or dramatic climax, a lighthearted filler episode allows the audience to catch its breath before building toward the next climax. It also allows the show's writer(s) to try out something creative and new. However, an overabundance of filler can leave the audience impatient, waiting for the return to something meaningful. That said, the filler in Cowboy Bebop comes in two forms: action-filled and comedic—and sometimes a mix of the two. Whether you enjoy these episodes is completely dependent on how much you enjoy the action and comedy respectively—or the episodes’ stand-alone plot. The biggest downside of seeing the epilogue only and not the full story is the amount of things simply left unexplained. This includes the very foundation of the setting—i.e., how a mere 73 years into the future (from the date Cowboy Bebop first aired) humanity has been able to terraform other planets, moons, and asteroids and give them earth-like gravity on top of that—among countless other unexplained aspects of the Cowboy Bebop universe. However, that's not necessarily a problem as much as a frustration from simply being invested and naturally wanting to know more—until it starts to affect the characters. Vicious, as the main villain, suffers greatly from lack of development. All we know about him is that he fought in a war, joined a crime syndicate, fought alongside Spike, and wants to take over the mob. From his actions we see that he is brutal in attaining his goals, but little else. Frankly, he is a one-note character; and while we know that Spike hates him viscerally, we never even learn why this is. The even bigger problem is what happens when the show's writers begin to play a bit fast and loose with the setting and story because they know they'll never need to explain it. This, in turn, brings up logical problems that affect the audience’s sense of disbelief—I'm looking at you, flying man with psychic powers. Faye herself is a prime example. For all intents and purposes, Faye came into the world a blank slate three years before her encounter with the Bebop. In that time she has, apparently, become a world class card shark (so good that she can cheat casinos), an above average spaceship pilot that can hold her own in a dogfight, and an expert hand-to-hand fighter capable of facing down large groups by herself. Again, all in just three years. Just because you as an author don't need to explain to the audience doesn't mean you don't have to explain it all in your own head at least and check to make sure it makes sense. It's an understatement to say that people have strong personal feelings about Cowboy Bebop. For many, it is what got them into anime in the first place and remains in their hearts the measure by which all others are judged. I, however, have no such nostalgic connection to the series. Cowboy Bebop is available on DVD in the United States with a Blu-ray release expected sometime in 2014.